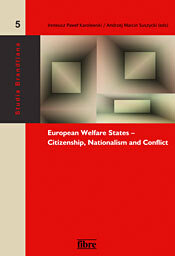 The volume offers contributions from social sciences dealing with new challenges to the European welfare state. It includes new theoretical insights as well as empirical studies with a focus on one country or cross-country comparisons. The case studies include Austria, Belgium, Ireland, European Turks and the Belarus. The authors are particularly interested in questions regarding the relationships between welfare state and citizenship, the conflict potential of different welfare regimes, immigration and welfare, conditions of solidarity in multi-ethnic societies, welfare nationalism as well as the welfare state in the context of a dictatorship. The volume assembles contributions of renowned academics from several countries such as Austria, Belgium, Germany, Poland, Romania, Switzerland and the US. They offer two major perspectives on the subject at hand, comprising the national framework of analysis of citizenship, nationalism, conflict and welfare as well as the comparative perspective. IRENEUSZ PAWEL KAROLEWSKI, associate professor of political science at the Willy Brandt Centre for German and European Studies, University of Wroclaw. His research interests include European citizenship, collective identity in Europe, theories of nation and nationalism; selected publications: Civic resources and the future of the European Union (London: Routledge, 2012), Citizenship and collective Identity in Europe (London: Routledge, 2010), Multiplicity of Nationalism in Europe (Lanham: Lexington, 2009). ANDRZEJ MARCIN SUSZYCKI, PhD in political science from the Humboldt University of Berlin. He is senior lecturer at the University of Potsdam and the University of Passau. He was senior lecturer and research fellow at numerous universities (University of Padua, Humboldt University Berlin, the Collegium Civitas University in Warsaw and the University of Southern Denmark in Odense). His research interests cover theories of international relations, foreign policy of European states, nationalism, and welfare state. His recent publications include Nationalism and European Integration (New York: Continuum, 2007), Nation and Nationalism: Political and Historical Studies (Wrocław: Atut, 2007) and Multiplicity of Nationalism in Contemporary Europe (Lanham, Lexington, 2009).